While the other kids were getting their jollies playing Running Bases or Dodge Ball, I got mine by being Nancy. They thought I was reading. Again. And they'd do their best to lure me away from my latest caper. Sometimes I'd go. After all, what eleven-year-old girl could resist a rousing jaunt on a pogo stick? It went something like this: bounce, ouch, bounce ouch. Soon I'd return, fresh Flintstones band-aid across my chin, to the pages where I'd catch up with my boyfriend Ned. (What a hottie.) Or Bess, George and I would rush off to such eerie places like the haunted bridge or the moss covered mansion. There was usually some great mystery to perplex/entertain us. But, naturally, despite the danger and the odds, we'd not only survive but solve the case. Talk about brave. I guess you had to have guts to be a kid, back when I was Nancy. 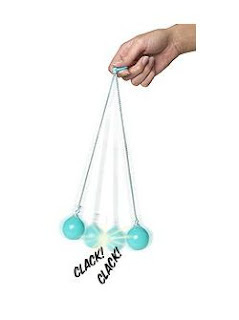 We had toys like Click-Clacks; those giant plastic balls that you had to swing up and down 'till they met and clacked. One summer I was the reigning Click Champion. This was also the same summer I had black and blue polka-dotted arms. We baked chocolate chip cookies using just a 60 watt bulb. This was when I learned that water treats burns better than butter does. We had our Sit 'n Spins, which was generally what we chose to ride just after we'd consumed large amounts of Wild Berry Kool-Aid. What kid doesn't need a good purple hurl every now and again? Yet when all was said and done, I'd retreat, back to the streets of River Heights with my dad, Carson Drew and good ole' Hannah our housekeeper. Where it was safer, in between those pages, then it was to be a real person, growing up in sweet suburbia.